Wide host range; including Evergreens, Cedars, Maple, Elm and Redbud. Attacked leaves become dull-coloured, bronzed or bleached foliage. Leaves may have stippled appearance and webbing may be present. Check underside of leaves for tiny mites and webs. Mites balloon on webbing to reach new food sources. They can be found nearly any time of year, especially during hot, dry weather. Multiple generations occur each season. 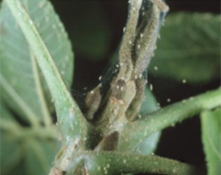 Two Spotted Spider Mite overwinter as adult mites in the soil or media around host plants. These mites are very tiny; a hand lens will be needed to see the two faint black spots on their backs. Mites are not insects; many insecticides are not effective against mites. When choosing a specific miticide, look for one that will spare predatory mites. Predatory mites and other natural enemies help to control populations. Soaps and horticultural oils can also be effective and will not have as lasting an impact on natural enemies. 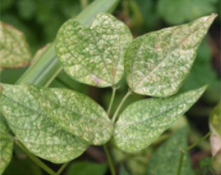 Treat leaf undersides when mites appear and repeat as needed. Monitor for mites by shaking a branch over a sheet of white paper and looking for tiny, moving specks. 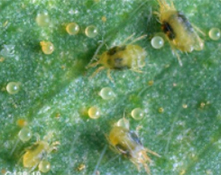 Two Spotted Spider Mite does not overwinter on the plant and populations are not reduced with a dormant oil treatment.